A new season begins. Image from here. The reason the carousel had stopped, of course, is because there were no more bags to spit out. All the bleary-eyed travelers had yanked and been yanked by that cruel machine empowered to deliver the final punctuation to the experience of air travel. One middle-aged woman (with a bag twice her size) was determined to pound her experience into an exclamation point. She was dragged no less than three times around the loop before she finally arrested the oversized beast. The crowd went from a collective gasp to a cheer as she rose unsteadily to her feet, one fist on the handle, the other, in the sky. She was the unseated rodeo rider who survived a runaway. I had no similar exercise. My bag was a no-show. I had half-expected it, but the realization was still bitter. I stood quietly in the nearly empty hall, my two fists clutching a small computer pouch. A wave of weariness washed over me. It is surprising disconcerting to find yourself in a hollow place halfway around the world in possession of little more than the clothes on your back. Blame erupted. First, I blamed our recent move. Somewhere back home is a storage unit containing boxes and boxes of our belongings. One box holds the backpack that is the perfect sized carry-on for a two week trip to Israel. BUT COULD I FIND IT? Of course not. So I was forced to resort to a bigger bag, one too large to be a carry-on (have I told you how I HATE messing with checked bags?). Beyond blaming our recent move, I blamed Detroit. I harbor no personal animosity toward the rusted motor city, but the flight that was supposed to take me to Atlanta did originate there. Because of “the little ‘Ice Age’ of 2015” (as it will surely be remembered), my plane had to take the long way around. Like maybe around Lizard-gut, Arizona. When news of our failed flight flashed, I was staring at the Delta monitor. My cat-like reflexes fired and I managed to outmaneuver my fellow travelers to a different gate where another flight for Atlanta was boarding. I could see the teeth of the grinning pilot as I sprinted down the jet bridge and slipped into the last open seat. He gunned the engines and we were off. I smugly buckled in. I felt as if I had survived a runaway of my own. But then a thought buzzed like a fly against the glass of my brain: my checked bag will never make the switch! We made Atlanta, then Paris. 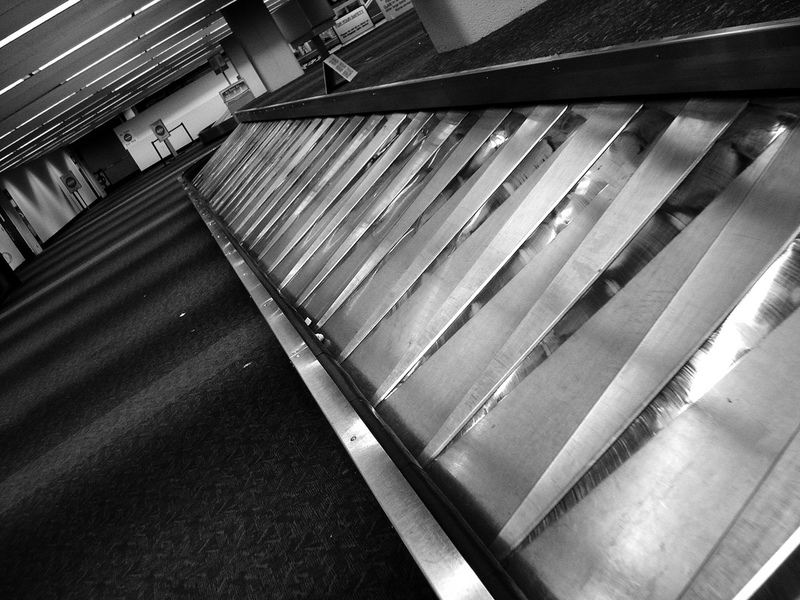 Between them, in the fitful sleep of TransAtlantica, I imagined all the happy luggage snuggling in the hold below me. It had been gently herded from belt to buggy to belly. My bag, I knew, could not possibly be among them. It was lost and unhappy in some dark and wretched purgatory. My fears were proved as I stood by the empty carousel. Empty carousel. Image from here. After sufficiently blaming myself, the storage unit, Detroit, and Lizard-gut, Arizona, I walked to the far end of the arrivals hall in Tel Aviv where an innocuous sign read “Lost and Found.” What I found there was a man with a heavy accent who could do many things at once. I might have been tempted to believe that he wasn’t paying attention to me at all, save for the fact that he chuckled ominously at just the right times to let me know that he could order Chinese carry-out, make change for an old army buddy, fill out a form, talk on the phone, and take my story simultaneously. Those multi-tasking Israelis! Of course, both of us knew that the bag in question would never be seen again, but the meeting was helpful insofar as I needed to get it off my chest and he needed the job. So we followed procedure. I rehearsed the more poignant segments and he grunted. He was just like a therapist, only less trained and better paid. Before we parted, he assured me that Air France had already redirected an entire gendarmerie from some third world country in search of my bag. We expected to hear from them at any minute. First, I will not listen to the fashion critics for the next two weeks. Second, Why do I have so much dental floss?